March 2016 Change Agents workshop participants. 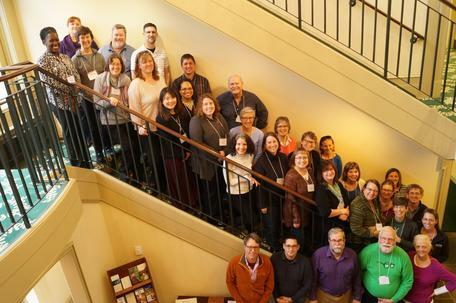 This four-year project will transform geoscience education in two-year colleges (2YCs) through an innovative program that focuses on 2YC geoscience faculty as "change agents." These faculty, working in teams, will implement high-impact, evidence-based instructional and co-curricular practices at their own institutions that will lead to improved STEM learning, broadened participation, and a more robust STEM workforce. They will work with administrators to institutionalize these changes, and will also propagate these practices to colleagues at 2YCs and four-year colleges and universities (4YCUs) in their region via an ongoing series of local professional development events. Cohort 1 is a set of ten teams of faculty which began their work in 2015-2016. An additional set of seven teams was added in 2017 to form Cohort 2. Follow the links below to read about the plans and activities of Change Agent teams.